The mitochondria are the cells' energy powerhouses, and coenzyme Q10 (CoQ10) is an essential component of healthy mitochondrial function. When the body has an ample amount of CoQ10 the mitochondria can work most efficiently throughout the entire body including the most densely populated area, the heart. CoQ10 is also a potent antioxidant, helping protect the proteins, lipids and DNA of mitochondria from oxidation, and supporting mitochondrial function. More humans are supplementing with coenzyme Q10 than ever before. One reason is the increased awareness that the 'statin' drugs used to lower LDL and cholesterol deplete the body of CoQ10. What most doctors don't know, however, is that normal aging may result in more of a reduction in CoQ10 than taking statin drugs. For example, while statin drugs have been shown to reduce plasma CoQ10 by 40%,6 the aging process reduces CoQ10 levels in the heart muscle wall by 72%. What is particularly frightening is the thought of people taking statin drugs who fail to supplement with CoQ10. The CoQ10 deficit caused by the dual affects of aging8 and statin drug use could result in severe depletion of cellular vitality. Since CoQ10 is such an expensive nutrient, an alternative to taking higher doses is to increase the amount of CoQ10 that is absorbed. 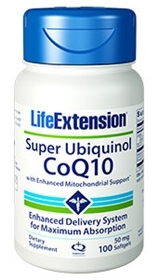 Life Extension offers the highly bioavailable ubiquinol form of CoQ10 in a patented delivery system that offers superior absorption level. When it comes to choosing a CoQ10 supplement, the primary factor is how many swallowed milligrams actually make it into your bloodstream. Coenzyme Q10 is a notoriously difficult nutrient to absorb. A recent study showed that in seriously ill patients, conventional ubiquinone CoQ10 was hardly detectable in the blood, whereas the new ubiquinol resulted in significant blood level increases and subsequent clinical improvements. Scientific studies show that ubiquinol remains in the blood far longer than ubiquinone. In studies measuring exercise-induced fatigue, ubiquinol was 90% more effective than ubiquinone. In middle-aged mice, ubiquinol was shown to be 40% more effective in slowing measurements of aging compared to ubiquinone. Japanese researchers have developed a novel ubiquinol delivery system that has been shown to double-peak CoQ10 blood levels (i.e., 100% greater peak absorption) in mice compared to the original ubiquinol formula. This enhanced ubiquinol formula also achieved a 66% greater amount of CoQ10 in blood over 24 hours compared to the original formula. Life Extension is the first supplement company to distribute this enhanced-absorbing ubiquinol. Other ingredients: safflower oil, gelatin, glycerin, beeswax, lecithin, water, polyglycerol fatty acid ester, caramel color. Contains soybeans. This product contains NO milk, egg, fish, peanuts, crustacean shellfish (lobster, crab, shrimp), tree nuts, wheat, yeast, gluten, corn, or rice. Contains NO sugar, and no artificial sweeteners, flavors, or preservatives. Take one softgel with food and a glass of water once or twice daily, or as recommended by a healthcare practitioner.